Participate in the conversation about how Council is proposing to attract new events to the Tamworth City and regional towns. The Tamworth Region has a strong reputation for hosting outstanding events and is home to a large range of high quality event facilities. With this in mind, Tamworth Regional Council would like to talk to the business community about the possibility of introducing a New Events Levy to help attract and create even more event opportunities for the Region. Our region has the facilities and the tourism network to attract major conferences, state and national sporting championships, and even international acts. The challenge however, is that to secure these events we are often required to offer subsidies, so we need a robust event attraction strategy with funding behind it. We know from our own event impact assessment methodology and other reputable data sources like the National Institute of Economic and Industry Research, that events build capacity in our Region. We also know that the impact of those events is not just enjoyed by the hospitality sector as there is a ripple effect of spending felt through the entire business community over time. 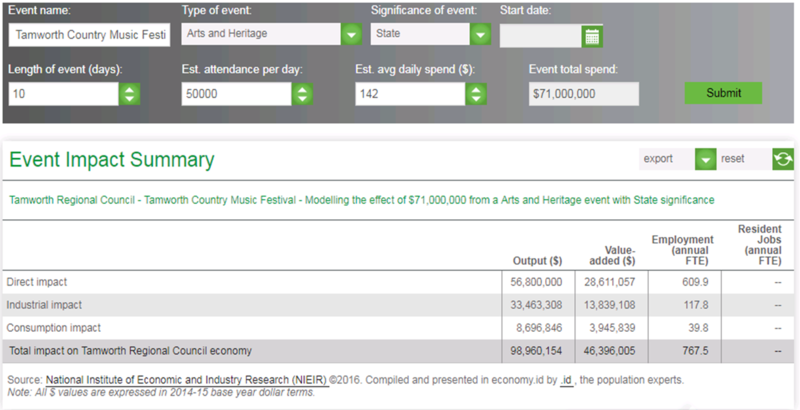 As an example, the event impact of the Tamworth Country Music Festival is shown below. The introduction of a Special Rate, specifically aimed at attracting and creating new events, and levied on an equitable basis across all business rated properties, would put us in strong position to compete with destinations like Coffs Harbour who are already pulling large scale sporting events from Tamworth. What was the final application made to IPART from Council and will my feedback and submissions be seen by IPART? Has Council appointed panel members already? Why do we need a special rate variation? Council resolved on the 5th February 2019 to submit an amended application to IPART, for a New Events Levy. The amendment was for the yearly rate increase above rate peg to be reduced from 3% to 2% over the 3 year period, commencing from July 2020. All formal submissions and commentary provided in the discussion board on yourvoice.tamworth.nsw.gov.au will be provided to IPART for their consideration. There has been no appointment of any panel members. The Tamworth Business Chamber has expressed they would like to have representation on the panel, any other peak body or industry representative is also welcome to express this wish. Tamworth is famous for its outstanding events and high quality facilities. Tamworth Country Music Festival; our purpose built equestrian centre AELEC and our incredible sporting facilities have all allowed us to build an enormous capacity to host events that make an incredible contribution to our local economy and the vibrancy of our community. Our community rightly expects that Council will work to maximise the opportunities this capacity provides which is why we need to have a conversation about how we fund the creation of new and exciting events that provide real benefits to our business community. What will be the impact on my business? The rate increase would be 2% plus the standard rate peg, to be phased in over a 3 year period. Below is an outline of what the impact of the 2% increase would look like. Please refer to the impact calculator tool on this page to determine the increase on your general business rate on your property. Industrial Impact: Indirect demand for intermediate goods & services across related industry. Who will the special rate variation apply to? The special rate variation will be applied to all ordinary rates across the region that have the Business category. It will not apply to the ordinary rate categories of Residential or Farmland. If the levy is introduced when would it come into effect? How will the special rate variation be implemented? For the special rate to be implemented it first has to be approved by IPART. IPART put mechanisms in place to ensure the funds raised are only used for the stated purpose - in this case the attraction and creation of new events. An event attraction strategy along with a robust event impact assessment will work as a guide to assess proposed new events . A panel will be put together consisting of both external and internal panel members that will include representation of the Tamworth Business Chamber to assess proposals. Council will demonstrate how the funds have been spent by reporting to IPART and the community every year as part of its annual report. The calculator tool is currently being updated - check back at a later date to calculate your rate. Join our forum to ask further questions, provide your thoughts and hear from others in the community and Council. What new events do you think would bring great benefit to our community? Tell us what you believe would bring economic opportunities to the Tamworth Regional Council region. Tamworth Regional Council is proposing a new event levy through a special rate variation, that including the rate peg of a cumulative increase of 2.70% in 2019/20, 2.84% in 2020/21, 2.88% in 2021/22 and 2.88% in 2022/23. There are currently 1,828 properties rated as business across the region and the average annual rate paid is approximately $3,500. The following table shows the additional revenue the proposal will raise over the phase in period for the events levy. Understanding the rate peg and the actual costs. Council is currently revising the actual costs in accordance with the adopted resolution made on the 5th February. Please check again shortly for updated information. The special rate variation will be applied to all ordinary rates across the region that have the Business category. It will not apply to the ordinary rate categories of Residential and Farmland. Are there other options for raising the required revenue? Council explored a number of opportunities to establish a permanent revenue stream for the ongoing management and attraction of major events in the Tamworth Regional Council area. This involved looking at alternate revenue sources to deliver what’s needed including a tourism accommodation levy, government grants and subsidies, sponsorship and existing Council revenue streams. The special rate variation was deemed the most valid and suitable option to ensure the objectives of the Event Attraction Strategy are met. More information as to why these options weren’t suitable can be found in the Council reports published on this portal. How do our rates compared? Each year the Department of Local Government release a comparison of rates between councils of a similar size and location. Even with the proposed levy applied, Tamworth’s business rates would remain 20% lower than similar local government areas. Where will the extra income be spent? Revenue raised through the special rate variation will be used to attract and create NEW events, conferences and sporting opportunities for the Region. A dedicated Event Attraction Strategy and an Event Impact Assessment Model has been developed to guide the process of valuing events to ensure a fair and equitable distribution of funds. A secondary assessment framework will measure marketing, seasonal and community impacts. How will we know this revenue is being spent properly? Council is obligated by the Independent Pricing and Regulatory Tribunal (IPART) to demonstrate and report annual on special rate variation income expenditure. Revenue raised through the variation must only be used for the purpose it is intended for. Council will also report to the community on a regular basis through its quarterly and annual reporting. An independent panel of experts will be sourced from the community to oversee the assessment process for events. The Tamworth Business Chamber will be an automatic appointment to this panel, and we will open a nomination process to find other suitable members. A series of activities occurring across the region including live and online engagement activities. The privacy of our website visitors is important to Tamworth Regional Council(TRC). The information we collect is used to facilitate the services we provide to you. This statement outlines how we collect personal information on the TRC website. By using the TRC website, you consent to the collection and use of your personal information as outlined in this statement. The TRC website uses'cookies'to help you personalise your online experience. A cookie is a text file that is placed on your viewing device by a Web page server. Cookies cannot be used to run programs or deliver viruses to your computer. Cookies are uniquely assigned to you, and can only be read by a web server in the domain that issued the cookie to you. One of the primary purposes of cookies is to provide a convenience feature to save you time. The purpose of a cookie is to tell the Web server that you have returned to a specific page. You have the ability to accept or decline cookies. Most Web browsers automatically accept cookies, but you can usually modify your browser setting to decline cookies if you prefer.If you choose to decline cookies, you may not be able to fully experience the interactive features of the TRC website. Any personal information that TRC collects from you on your visit to our website may be recorded by TRC. If TRC does so, you have the right to access and amend this information to ensure that it is correct.Only TRC and its members, employees and agents will use personal information collected on TRC’s website. Personal information collected from you is held and used by TRC under the provisions of thePrivacyand Personal Information Protection Act1998. Furthermore, TRC has aPrivacy Management Plan to to inform the community about how their personal information will be used, stored and accessed after it is collected by Council, and Council staff of their obligations in relation to handling personal information and when they can and cannot disclose,use or collect it. TRC will occasionally update this Privacy Statement to reflect TRC policies and customer feedback. TRC encourages you to periodically review this Statement to be informed of how TRC is protecting your information. Should you have any questions about TRC, this Privacy Statement or anything on the TRC website, please contact us. The following Terms and Conditions govern the use of MyTRC Online Community (“the site”). The platform is owned and operated by us, Harvest Digital Planning Pty Ltd (Harvest), on behalf of Tamworth Regional Council. What is your relationship to Council?